Childbirth usually proceeds with nothing more than a few minor difficulties that are taken care of without any lingering effects. In some cases, however, serious complications may occur, leading to lifelong struggles for a child and the child’s family. These occurrences are painful enough to handle when they happen naturally and without the negligence or fault of medical professionals. But, when medical malpractice is a cause of childbirth complications, or injuries sustained through the improper handling of complications, the child and the child’s family may be entitled to compensation through the institution of legal action against the responsible parties. If your child has suffered a childbirth complication injury or has died as a result of childbirth complications due to medical malpractice or negligence, contact experienced birth injury and childbirth complication attorney Jeffrey Killino at 877-412-8490 for a free evaluation of your case. The failure of medical professionals to recognize and appropriately handle any of these and other childbirth complications may lead to serious injury or death of a fetus. When medical professionals assist in a child’s birth, they are held to a duty of care toward both their patients: the mother and the fetus. The mismanagement of a childbirth complication during labor or delivery may result in injury or death to either or both patients and subject medical personnel to legal liability if the negligence of such personnel was a cause of the injury or death. Negligent treatment of a woman during her pregnancy may also result in childbirth complications for which medical personnel may be held liable. An obstetrician owes a duty of care during a woman’s pregnancy to monitor and protect the health of the mother and her fetus. If the obstetrician breaches this standard of care by negligently failing to detect conditions that may lead to childbirth complications, the obstetrician may be found liable in a medical malpractice action for the fetus’s injury or death resulting from the undetected condition. If, for example, the obstetrician fails to monitor a pregnant woman’s weight gain or diabetes during pregnancy and her excessive weight gain results in fetal macrosomia (a fetus above the average weight for its gestational age), the obstetrician may be found liable for childbirth complications, such as shoulder dystocia, that are found to have occurred as a result of the fetal macrosomia. An obstetrician or other medical professional assisting in the birth of a child may also cause childbirth complication injuries or enhance injuries due to such complications through negligent care during the labor and delivery stages of childbirth. If a childbirth injury or death is determined in a medical malpractice action to have resulted from such negligent care, the negligent medical personnel, and in some cases the hospital that employs such personnel, may be found liable for the fetus’s injury or death. The failure of an obstetrician or other medical professional assisting in the birth of a child to properly monitor and respond to fetal or maternal distress, for example, may be found to constitute a cause of a childbirth complication injury. Failure to timely recognize and appropriately handle shoulder dystocia may also result in liability of medical personnel assisting in a child’s birth, which can occur with or without the negligence of an obstetrician during the mother’s pregnancy. Negligent management of the breech presentation of a fetus, one of the most common childbirth complications, may also result in liability of medical personnel assisting in a child’s birth. Emergency Caesarian sections are often required to save a baby’s life when a breech presentation occurs, so that the failure to timely order a C-section when indicated may result in serious injury or death to the fetus and liability on the part of the obstetrician who failed to exercise due care in the ordering of the indicated procedure. Obstetricians and other medical professionals who assist in a child’s birth are often employed by the hospital in which a child is born. If the negligence of hospital employees is determined to have been a cause of a child’s birth injuries, the hospital, as the employee’s employer, may be held vicariously (indirectly) liable for the child’s resultant injuries or death. If the hospital is determined to have been negligent in its screening, hiring, training, and retaining of such a negligent employee, the hospital may be found directly liable, as well. If your child has sustained childbirth complication injuries or death and you believe medical malpractice or negligence was a cause of your child’s injury or death, you may be entitled to compensation from those responsible. 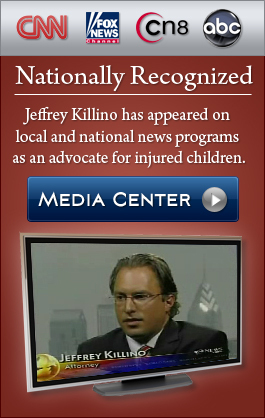 Attorney Jeffrey Killino is a highly regarded and nationally recognized birth injury lawyer with extensive experience with all types of medical negligence and childbirth injury cases. Contact attorney Jeffrey B. Killino at 877-412-8490 for more information about your legal rights and options.